I decided to post the "mentions of Emma" articles on Sundays now. They never are particularly interesting and there's never anything to post on Sundays, so that'll fill it. "Listen, Jennifer Lawrence deserves every bit as much as her male counterpart. It's indisputable. Emma Watson is an amazing young woman, and it's important for her to talk about women's issues. She isn't concerned about herself. Women are paying the bills, getting it done, getting the kids here and there. The more we address that, we are all going to be better." "Hermione Granger – Emma Watson – she is just a fox!" he also said at the time. "That whole Harry Potter grind got me obsessed. I did some shout-outs and maybe she'll see that when Olympic time comes around." 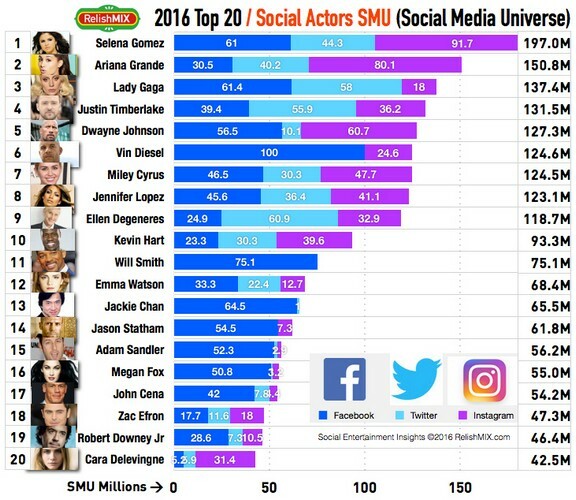 After the actor Vin Diesel hit the 100M followers on Facebook, Deadline decided to list the Top 20 actors on social media. Emma is #12 with 68.4M followers.